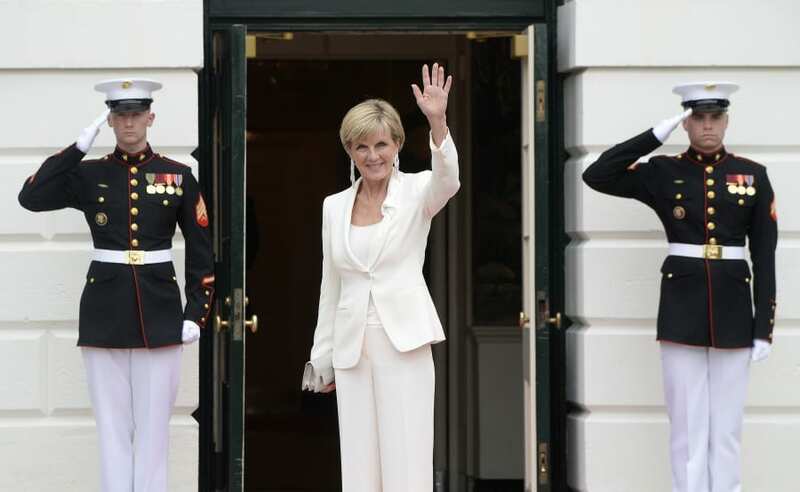 Fashion and politics are two words which don't often collide, except when it comes to our Foreign Minister Julie Bishop. Whether it's in parliament or on the world stage, Bishop always manages to look stylish, sleek and totally fabulous for every occasion. In an interview with Stellar magazine, Bishop described it as 'insulting' for people to suggest her femininity and interest in fashion should mean she can't have a serious career at the same time. "I have always loved fashion and beautiful clothes and magazines and all of that, that doesn't mean I can't have a serious career and hold deeply complex, serious conversations about world events with people," she told the magazine. We look back on some of Bishop's best outfits, proving you can dress like a feminine fashionista while being a total boss at the same time. What to wear when you're meeting the British Foreign Secretary? High waisted, chequered shorts, of course. Giving us all a lesson on how to keep an all-white pantsuit clean. World, take note. This is how you do shoulder pads. Putting the party, right back into politics. Want to stand out in a sea of white, black and grey? Invest in an orange blazer. Stat. We need the number of her stylist, pronto. When you're giving Collette Dinnigan a run for her money on the black carpet, you're doing something right. There aren't enough sparkly blazers in politics, TBH.